Burglary is one of the most common charges in Oklahoma. The reason this charge is seen so often is due to the nature in which the crime is committed. 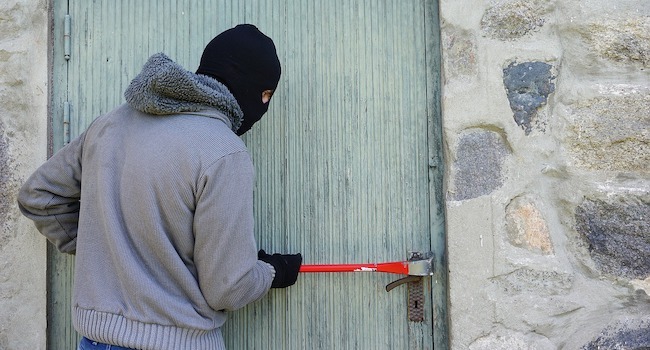 A burglary will always necessarily include a “breaking and entering” which alone is only a misdemeanor. However, a breaking and entering offense becomes a burglary charge when the breaking and entering is committed with the intent to commit any further crime. While not as serious as violent crimes, burglary carries significant punishments. If you've been charged you should speak with an experienced attorney immediately. Consequently, every person who breaks into and enters the dwelling house of another, in which there is at the time some human being, with intent to commit some crime therein, will usually be charged with burglary in the first degree. The “breaking” aspect of the crime can be accomplished in a number of ways. It can be satisfied by someone actually using force to burst or break a wall, an outer door, a window, or the lock or bolts of any door to the dwelling. Even simply breaking the fastening of a window or shutter is enough. Moreover, an actual “breaking” as described above (and as thought about from a common-sense perspective) is not even necessary for a burglary. Oklahoma law allows for the charge of first-degree burglary for “breaking” in ANY manner. Simply unlocking an outer door with a false key, picking the lock, or lifting a latch or opening a window (even if not locked) is sufficient to effectuate the crime. Naturally, being armed with a dangerous weapon in the course of the breaking can also lead to first degree burglary charges. Speaking with a qualified attorney can help you get your charges reduced in certain circumstances. Perhaps the most important thing to remember when distinguishing degrees of burglary is that a defendant can only be convicted of first-degree burglary if another person is present in the dwelling house when the defendant breaks into and enters the location. If no person is present in the dwelling house when the defendant breaks into and enters, then the defendant can only be convicted of second-degree burglary. So long as no one is present in the area, individuals will only be charged with burglary in the second degree if they break and enter into any building or any part of any building, room, booth, tent, railroad car, or other structure or erection, in which any property is kept, or break into or forcibly open, any coin-operated or vending machine or device with intent to steal any property. Recently, Oklahoma also added a separate criminal offense of burglary in the third degree. In years past, anyone who broke into an automobile, truck, trailer, or vessel in which property was kept with the intent to steal that property, was also guilty of burglary in the second degree. As of November 1, 2018, though, any person who commits that act will only be charged with burglary in the third degree. It is still a felony offense, but the punishment range is lower. The addition of burglary in the third degree was meant to assist in Oklahoma’s attempts at prison reform. The addition of the third degree makes sense from a logical point of view: breaking into a vehicle is definitely still something that should be charged as a serious crime, but it is not as serious as breaking into someone’s home. When breaking into someone’s home, it is often times simply dumb luck that there is no one present when the breaking and entering occurs. When someone breaks into a vehicle though, they can usually tell beforehand if anyone is in the vehicle simply by looking in the windows. Even though breaking into another person’s car or truck should definitely still be charged as a felony, it should not carry the same punishment range as breaking into another individual’s home or building, where there is much more potential for a person to be present. Burglary in the first degree is punishable by a term not less than seven (7) years nor more than twenty (20) years incarceration. Burglary in the Second Degree. Burglary in the second degree is punishable by incarceration not exceeding seven (7) years. Burglary in the Third Degree. Burglary in the third degree may result in a sentence of imprisonment not exceeding five (5) years..
Another important distinction to keep in mind is that burglary IS NOT robbery. Many individuals confuse the two crimes, but they have separate and distinct elements that must be met. If you or someone you know is facing charges of burglary you should contact an attorney at the Law Offices of Adam R. Banner, P.C. for immediate help.